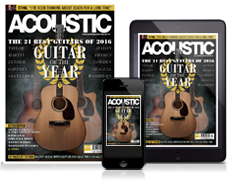 ACOUSTIC WEEK: Wolfram Slides founder David Browne investigates how the length, shape and finish of your nails affect sound, and shares his top tips for achieving and perfecting your acoustic guitar tone. We all love chasing tone - choosing that special, awesome-sounding guitar, perhaps even auditioning different types of strings. You chose your guitar because you love the way it sounds; yet, on its own, your guitar makes no sound at all. As a fingerstyle guitarist your nails are a crucial part of the interface between you and your guitar. Many new (and indeed experienced) players ignore these vital tone-generating assets; others realise the importance but are confused about how to go about shaping. I remember being incredibly frustrated when my guitar sounded different every time I clipped my nails. Sometimes it sounded great, but I was unable to consistently achieve that tone I knew was in there. Long or short, the shape, finish and condition of your nails define the tone and feel you will get from your instrument. Let’s look at how each of these aspects influence your sound, and then I'll give you my three golden tips for achieving and perfecting the tone you’re after. The length of your nails does have an impact on tone. However, contrary to popular belief, it’s not necessary to keep your nails long to achieve great tone and volume. Indeed, in some cases, longer nails can actually reduce the versatility of your tonal palette by restricting you from using a combination of flesh and nail. It’s the shape of your nails, more than their length, that will make or break your sound. Try keeping your nails to no more than 1-2mm over the end of your fingertip. There is no definitive right way to shape your nails - this depends on the natural curvature of your nails and your particular hand position and playing style. 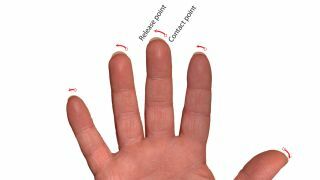 However, on plucking a note there are three basic phases or interactions between your nail and the string: the contact point, the string travel and the release point. Play slowly and watch carefully how your fingertip and nail interact with the string. Once you understand these three phases, you will be able to shape your nails for the tone you want. Let’s look at each one in turn. The contact point has some effect on sound, but is particularly important in establishing control, defining feel and enabling speed. The main thing to look for is the balance between flesh and nail on this initial contact. Shaping so that the flesh and nail contact the string simultaneously usually gives the best balance between tone and control. Shaping so that the nail alone contacts the string will usually yield a brighter tone with a more pronounced click to the attack; shaping so that flesh alone contacts the string will result in the softest, quietest tone, and usually leads to some loss of note definition. As you pluck through the note, your nail maintains contact as it travels across the string. You can control the length of this phase by altering the angle of your picking hand - picking perpendicular to the strings will reduce it to almost zero; angling your hand so that the movement of your fingertip tracks along the string somewhat will lengthen it. Watch carefully how your nail moves the string as you play. In general, shapes that move the nail parallel to the guitar top will result in a brighter tone; shapes that also push the string downwards towards the guitar top, such as the ramp shape shown, will result in a richer, deeper tone. The contact point and string travel set up the string. The release point is where you set it free to ring. Pay attention to where the string releases for your particular playing style - you may actually be using far less of your nail than you thought. Shaping at the release point can have a pronounced effect on the attack of your note. Shaping so that the nail falls away gently will help you achieve a cleaner, more rounded sound; a steeper string release will tend to give you a brighter tone. Try shaping your nails into a smooth angled ramp shape for a rich, deep tone from both flesh and nail. The finish quality of your nails is absolutely critical to your sound - in many ways, even more important than the shape. Any friction or roughness during the string travel or release point phases is bad for two reasons. Firstly, it will compromise your tone, adding harshness and scratchiness, particularly to the treble strings. It will also affect the feel, adding unnecessary friction and requiring more playing effort. Many players will at some stage complain of cracked or chipped nails which, as a guitarist, can really ruin your day. One leading cause of this is nail clippers. As they close on the nail, clippers force it unnaturally flat against its natural curvature, before breaking harshly through to cut the nail. The combination of flex and compression strains the nail, causing tiny stress cracks to develop around the edge. With wear and playing, these cracks can weaken the nail and lead to major chips and splits. It is much better to file your nails than to clip them. When shaping your nails, you will get much more controllable, consistent results using a rigid nail file rather than sandpaper. Take long sweeps with the file, tracing out the shape you’re after. Take care when using files, emery boards or sandpaper with a sharp abrasive, which work by tearing at the nail to remove material. Very fine abrasives can be great for achieving a smooth finish, but beware coarse abrasives which can cause or exacerbate tears, chips and cracks - especially when filing against the grain, away from the centre of the nail.